Birkenhead North station is a three-platform station, two of them on an island. Platform 1 contains the ticket office and other rooms in the original red brick building. Sadly most of the windows are covered in wire mesh or iron railings. 67030 is waiting in platform 3 and moves off towards Birkenhead Park where it changes onto the down line and comes through the station by platform 1. The train I get is fairly empty and we move off past the depot on the right. On the left is a small river with warehouses on the other side. The line to West Kirby then goes off on the left and we pass through some marshland with some rusting sidings on the right. We pass an old signal box on the left and then a curve from Bidston joins us, as we go under the M53. We then pass a school playing field and the first houses of Wallasey on the right. On the left is a football ground as the marshland fades and houses star to appear. We come into Wallasey Village station, which has two modern looking buildings on each platform with canopies over them. We go into a short cutting and then pass terraced houses on both sides, before coming into Wallasey Grove Road. It has two long platforms and a road bridge goes over the platforms. It still has its original red brick building. There are no railings here unlike Birkenhead North. There is a large car park on the right, which is full today. The line the curves to the right, passing flats on the left. We then pass a golf course on the right and the sea appears on the left. It is quite choppy today and there is a wind farm in the distance. You can see Liverpool docks on the right across the bay and then we come to a stop right next to two high-rise blocks of flats on the left. We wait for a train to come out of New Brighton station and then we proceed though a cutting and into New Brighton station. 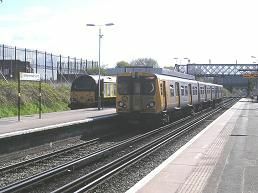 It is a two-platform island station with three other sidings in the station. There is a large canopy over the platforms and there is separate gents toilet on the right and a ticket office in the original red brick building. It is not quite in the town centre and was built in 1888 according to a sign on the station and had 10,000 passengers a day in its heyday.